The beaches of Goa and Karnataka is the best combo beach destination on the one hand you had the regular hip-hop beach attraction whereas the Karnataka has several alluring beaches is not known to everyone and so the beaches of Karnataka are tranquil and isolated tourist beach destinations, where you won't find crowds as you might in other popular beaches in India. The beaches of Karnataka are one of the best for honeymooners, where peace and the whispering of the sea, offers you a relaxed beach holiday. Some of the famous beaches are Karwar, Mangalore, Ullal and Mangalore will give you a delightful beach honeymoon destinations, where you can have a refreshing getaway. Arrival at Goa. Met and assit at the airport transfer to the hotel. Rest of the day at leisure. Overnight at hotel. Breakfast at hotel. Full day tour to beaches, temeples & churches. Later boat cruise at Mandovi river. (Subject to weather condition). Overnight at resort. 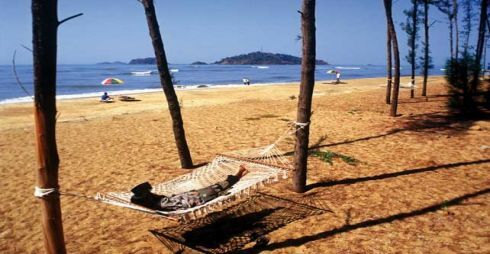 The day to enjoy as per your interest or just relax at one of the beach of Goa. Option for having different water sports activities like Jet Ski, Banana Riding, Water Speed Boat, Water Skiing, Scuba Diving, Parasailing, Water Scooter and windsurfing. You can also visit to Bat Island Trip for Snorkeling, Scuba Diving, Dolphin sighting, deep water fishing. Overnight at Hotel. After breakfast proceed to Karwar. Karwar, the port town on the banks of the Kali Nadi river is the administrative head quarters of North Kanara District in Karnataka. It is an Excellent Beach resort with beautiful palm fringed beaches. Karwar has all the makings of a perfect holiday for beach honeymooners with gentle waves, palm-laced beaches, silver sand, and calm, peaceful alleys. On arrival hotel/resort check in. Day at free optional proceed for sightseeing of temple or harbour. Overnight at Hotel/Resort. After breakfast proceed to Gokarna a picturesque drive through rocky mountains towards left side of Wstern Ghats and Arabian sea on the other side. Its hindu pilgrimage centre as well as popular tourst destinations. The main deity is Lord Mahabhaleshwara, a form of the Hindu god Shiva. Around the town lie a number of beaches which serve as a major attraction for travellers.The famous beaches are Gokarna beach (also known as Indian Beach), Main Beach, Kuddle Beach, Om Beach, Half moon Beach and Paradise Beach (also known as Full moon). The Gokarna beach forms the coast of the town and is followed by Main beach in northern direction while the other four beaches lie to the south of Gokarna. Arrival hotel check in. Rest of the day to explore the ancient beach town. Overnight at hotel. After breakfast drive to Udupi- Udupi is notable for the Krishna Temple, and lends its name to the popular Udupi cuisine. Udupi, also known as Rajata Peetha and Shivalli (Shivabelli), a centre of pilgrimage, is situated about 58 km north of Mangalore and about 422 km north-west of Bangalore. Udupi lies close to the Arabian Sea and the famous Malpe Beach is just 10 kms away from here. Pay a visit to temple take blessing and stay at hotel. Overnight stay in honeymoon suite room. Today enjoy water sport facilities at beach. Overnight at hotel. Leisure breakfast breakfast drive to Managlore for onward journey. Any extra Meal, Entrance fees, expenses of personal nature like tips, beverages, Laundry, Telephone. Carry your money and travel documents (preferably wrapped in plastic to avoid dampness) in a Money Belt around your waist well hidden from sight. The peak season in these places is between October and January. It is also the time when Indian Beaches are most crowded, more festive than any other time of the year. The daytime temperatures are comparatively not too hot and the nights are pleasantly cool. It is also less humid than the rest of the year. Check out the small hotels in a number of tourist spots. They are more likely to provide you with some exotic and authentic cuisine than your starred hotel accommodation. However be careful about drinking water in any such place. Always insist on bottled Mineral Water.